The GRM Tools Collection is an un-compared set of 15 amazing plug-ins that have been used by most renowned composers and sound designers around the world. 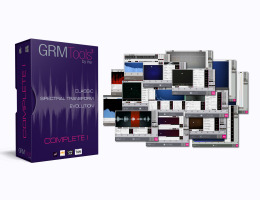 Each GRM Tools plug-in offers powerful and unique sound transformation and audio processing features. Conceived and crafted by the GRM Group (Groupe de Recherches Musicales) of the famous National Audiovisual Institute of Paris (France), GRM Tools 3 is the result of numerous years of research, experimentation and development. The GRM Tools Collection contains 15 AAX, RTAS, VST and Audio Unit Plug-ins and can also be used as Stand-Alone applications. Starting with the 3.5 version an iLok is still required, but an iLok dongle is no required for authorization. With the iLok License Manager, you can deposit your license either on a 'computer' or on the 'iLok USB dongle, the choice is up to you. (iLok keys can be purchased from www.ilok.com or at your local dealer). An AAX, RTAS, VST, Audio Unit host application for plug-in use. Download and try The GRM Tools Complete Collection demo version without limitation of time. (No authorization required). Demo versions available from the Downloads tab, here! NO AUTHORIZATIONS ARE REQUIRED TO RUN THE GRM DEMO VERSIONS !